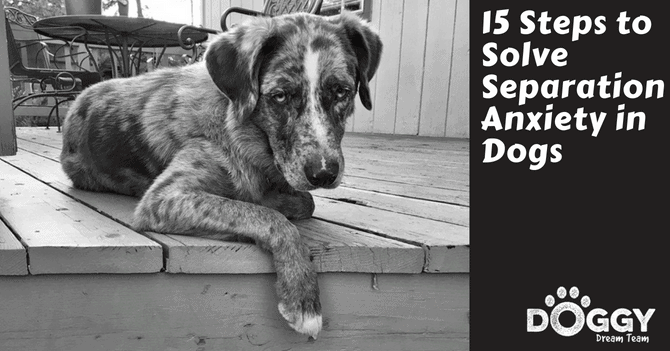 15 Steps to Solve Separation Anxiety in Dogs. Which of the following are signs of separation anxiety in dogs? Trick question! All of the above are clues that a dog experiences distress (also known as separation anxiety) when left alone. Have you ever felt completely out of your depth? Perhaps you were asked to give a speech in front of a room of strangers or went for a job interview without preparing properly. Well, this type of anxiety is just a fraction of the deep insecurity some dogs feel when left alone. Dogs with separation anxiety over-rely on their owner’s and lack the skills to cope when left alone. Their deep-discomfort finds an outlet in displacement activities such as destructiveness, barking, or peeing. There’s no ON-OFF switch for separation anxiety in dogs. It takes dedication, consistency, and patience to stretch those apron strings, but the following 15 steps can help. Do you always put your shoes on first, grab the car keys, and shrug on a coat…in that exact same order, every morning? What you’re unwittingly doing is advertising to the dog that you’re about to leave. In the same way we feel anxious ahead of an exam or a visit to the dentist, this needlessly ramps up the dog’s stress ahead of the actual event. You get the idea…now get creative! How to stop separation anxiety in dogs means being less predictable. Try to shake up your routine. Don’t always leave by the same door. This is all about reducing the cues which make adrenaline flood the dog’s system and make him feel panicky. Which brings us to the right way to leave. Don’t make a big thing of going. The more casual and matter-of-fact you are, the less the dog can read into events. Indeed, in an ideal world just slip out unnoticed. In fact, distract the dog…. When the dog feels safe and secure, he’ll be less anxious about being left. Separation anxiety in dogs treatment means providing him with a safe den. Put one of your old t-shirts inside, so that it smells reassuringly of you. Crate training is a good idea, however, be sure to do it right. Only leave the dog in the crate if he’s 100% happy there and won’t try to escape, or the crate becomes a prison. But the advantage is, when a dog is properly crate-trained he’ll feel protected there, which reduces his anxiety about being left. Crates are great for separation anxiety at night, as the familiar, den-like place gives an extra sense of security. Use a plug-in diffuser, such as Adaptil, that gives of doggy pheromones. These are the same chemical messengers given off by a nursing mother dog that helps her pups feels content. When you come in the door, ignore the dog. Yep, that’s right. Don’t let those puppy dog eyes and whimpers call you over. If he’s crying, steel your heart and ignore him. When, and only when the dog is quiet, then you can acknowledge him. This stops the dog thinking the only way to get attention is to be noisy. Also, don’t make a big thing of coming home or you risk the dog thinking being left alone was a big thing. Play the homecoming casual and reduce the subtext of implications about how awful it was to have to leave him. One of the signs of separation anxiety in dogs is distress and asking for reassurance. The trouble is, when you fuss a crying dog, you reward this unwanted behaviour. Ironically, in the dog’s mind the lesson learned is “Crying gets me attention”, and a vicious circle develops. Well, step off this merry go round by ignoring crying. Instead, make a point of praising the dog when he’s quiet. If he’s resting in his bed, minding his own business, make a point of going over and praising him. This rewards his excellent behavior and tips the scales back in your favour. In much the same way, you want to reassure a crying dog but don’t go there. Your attention is a powerful reward. The dog will interpret this as meaning he was right to be worried, and sympathy makes matters worse not better. So whilst it seems hard, dog separation anxiety solutions involve not acknowledging his upset for his own good in the long run. Some of the physical signs of separation anxiety in dogs includes a racing heart, panting, restlessness, and loss of bladder or bowel control. Anxiety is a real and physical thing that causes the heart to race, a dry mouth, and shortness of breath. This is all down adrenaline and cortisol that go whizzing through the bloodstream when something triggers than anxiety. But when you reduce the cues that tell a dog you’re leaving, it helps lower the unpleasant physiological effects such as the pounding heart. So instead of the dog watching you leave and getting all worked up, distract him. Offer him a super tasty treat and slip out the door while he’s occupied. Or offer a Kong stuffed with scrumptious food. In fact, put the stuffed Kong in the freezer first so the food is harder to get out. On the subject of cues, watch your body language and take care not to act concerned about going. Dogs are masterful at interpreting our body language, and will quickly pick up on tension. Even if you don’t feel it, act casual about leaving the dog like it’s no big deal. A bored dog or one brimful of energy is liable to look for entertainment. When left alone, the dog may resort to destructive behaviour or barking to alleviate the boredom. However, a dog that’s pleasantly tired after a good romp round the park, is more likely to settle for a snooze. OK, so it’s not the whole answer to a dog with bad separation anxiety, but lots of little things can add up to make a big difference. Take stock of how much time you spend with the dog when you are home. You may be surprised how little time apart there is. Heck, the dog even follows you to the bathroom. How can you expect a dog that’s like your shadow, to be cool when you disappear for hours? It’s important to slowly get him used to spending time without you. Make a start by not allowing the dog to accompany you into the kitchen. If necessary, use a childgate so that he can see you but not physically be at your feet. When he does at last settle in a different room, praise his great achievement so that he sees this as a great thing to do again. Now think about all the things you do for the dog? Ask yourself who walks the dog, who feeds him, and who grooms him. If you do everything, then it’s no surprise the dog wants to be with you 24/7. You may find this harder than the dog does, but it’s time to let other people into your four-legged life. Have friends or family feed the dog and walk him. Help the dog to see the world doesn’t end when you go, because other people can look after him. Basic obedience training builds the dog’s confidence. This isn’t about being heavy handed with the dog. Use reward-based training methods to encourage your dog to learn to listen to you. This increases his sense of security and is a great distraction from worrying about life. Train regularly for a few minutes at a time, such as during the ad breaks in your favourite soap. You can then practice having the dog “Sit” and “Stay” while you make a cuppa in the kitchen. Not only does this stretch the apron strings, but it’s a sneaky way of getting the dog to trust you. Then, when you act relaxed when leaving for work, the dog knows you are in control and if you aren’t worried then why should he be? When you return home to find the sofa chewed and poop on the best rug…take a deep breath and stay calm. If you need to let off steam, go out into the garden and shout at a tree. Punishing the dog will only make matters worse. He won’t link the punishment to the crime. Instead, it ramps up the anxiety about your return, wondering if you’re going to be in a good or bad mood. So not only does the dog feel bereft in your absence but he’s now conflicted about your return. Just get on with the clear up, and cut the dog some slack. One of the more extreme signs of separation anxiety in dogs is self-harm. If your dog gets so distressed he hurts himself or damages the house, then speak to your vet. For severe separation anxiety in dogs medication can really help alleviate the very real distress the dog feels. This doesn’t mean the dog will become addicted. 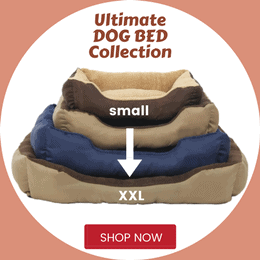 Think of them as a tool to calm the dog while retraining him to cope home alone. Helping a pet pal with separation anxiety takes time, effort, and commitment. First, it’s crucial to recognize the signs of separation anxiety so that you don’t make matters worse by punishing a dog’s destructive behaviour. Follow the 15 steps listed above will help reduce your dog’s separation anxiety, but always seek the help of a registered animal behaviourist if you feel out of your depth.